You can use the Wyrm for commercial renders, but you can't use any part of the textures as a merchant resource. This modified version is NOT under the same licensing as the original, and cannot be redistributed in its present form, or further modified, for free or sale. If you need/want to redistribute the Wyrm, please use Fredrik's original. 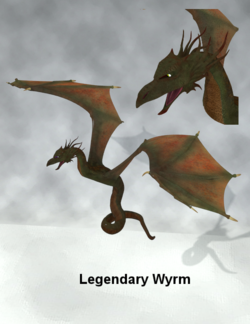 Legendary Wyrm Reloaded is a figure of a dragon of the Norse kind. There is an error when the file is unzipped. One of the texture files is not complete. Also not all of the requested texture files are included in the zip. The wing and eye textures are missing. This page was last edited on 25 August 2018, at 06:24.